Abraham Lincoln was born in a log cabin on Sinking Spring Farm, in present day LaRue County, Kentucky. He was born on February 12, 1809. His father was a farmer named Thomas Lincoln. His mothers name was Nancy and she would only live until 1818. As a result, Abraham's father married Sarah Bush Johnston the following year. Sarah proved to be a positive influence in Abraham's life. She encouraged him to get an education. Abraham enjoyed reading everything from the Bible to Shakespeare. Then in 1831, the family moved to Illinois. Shortly afterward, Abraham left the family farm and moved to New Salem, Illinois. The Black Hawk War broke out in 1832, the militia in New Salem elected Lincoln their captain. 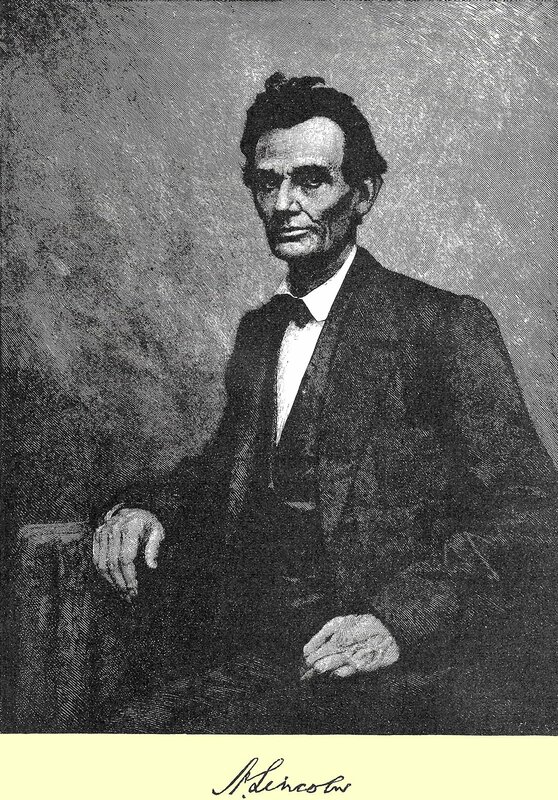 Two years later Lincoln was elected to the Illinois State Legislature where he served four terms. At the time Lincoln was a member of the Whig Party and a fervent admirer of Henry Clay and his stance against slavery. Both Clay and Lincoln believed that the institution of slavery was both bad policy and unjust. Abraham became a licensed attorney in in 1836. Then a few years later, he married Mary Todd. Lincoln was elected to the House for Representatives in 1846. While in Congress he opposed President Polk's Mexican American War, and he supported the Wilmot Proviso which banned slavery in all territories that were obtained by the war. The Proviso also compensated the abolition of slavery in the District of Colombia. After serving one term, Abraham returned to his law career which thrived. Then in 1854, he would run for the U.S. Senate and lose. Then, just two years later the Illinois Republican Convention nominated him to run for the Senate against Stephen A. Douglas. During the 1858 campaign they held a series of debates that drew widespread attention to both candidates. At this time, Lincoln clearly stated his opposition to slavery. He said that the Declaration of Independence applied to African Americans as well. However, Douglas won the election. Then in 1860, the Republicans nominated Lincoln for the presidency. He won the election with less than 40% of the popular vote. Almost all of his votes came from the free states. From the very beginning of his term he was confronted by one crisis after another. Soon after being elected the Southern states seceded from the Union. The next crisis involved Fort Sumter, South Carolina. Lincoln had a choice to evacuate the fort or hold on to it. He chose to hold it, but the Confederates had other ideas. They captured the fort on April 12, 1861. As soon as the fighting began Lincoln called up 75,000 volunteers. At the same time he initiated the Anaconda Plan that ordered the naval blockade of the Confederate coast. President Lincoln would not find a general who understood what he needed done until General Ulysses S. Grant. Shortly after winning the Battle of Antietam Lincoln issued the Emancipation Proclamation. He declared free those slaves in rebel areas and said that the freedmen would be received in the armed services. His recruitment of African Americans would result in more than 180,000 of them enlisting on the side of the Union. General Sherman's victory in Atlanta, as well as other military successes helped Lincoln get reelected in 1864. However, his life would be cut short when he was assassinated by John Wilkes Booth in Ford's Theater in Washington D.C. on April 14, 1865.